Colombian President Ivan Duque speaks as U.S. Secretary of State Mike Pompeo listens during a news conference at the guesthouse in Cartagena, Colombia, Jan. 2, 2019. The United States is deeply concerned about an increase in coca cultivation in Colombia, Secretary of State Mike Pompeo said on Wednesday, but will work with the Andean country to cut production of the raw material for cocaine in half by the end of 2023. "The United States remains deeply concerned about the surge in coca cultivation and cocaine production in Colombia since 2013," Pompeo told journalists following the meeting. Colombia has long been ranked as the world's top producer of cocaine, for which coca is the base ingredient, but figures compiled by the United Nations for 2017 showed the largest potential output since the organization began keeping records, with cocaine production at 1,379 metric tons. "We will continue to work with you Mr. President side-by-side to achieve our joint objectives to cut coca cultivation and coca production by 50 percent between now and 2023," Pompeo said. Colombia's acreage of coca, the raw material for cocaine, expanded 17 percent to 171,000 hectares (422,550 acres) in 2017, according to the U.N. The uptick was due to increased productivity and growers eager to expand in hopes of getting more aid to switch to legal crops. The U.S. commitment to helping Colombia dismantle organized crime groups is "vital," Duque said in his remarks. Venezuela's President Nicolas Maduro speaks after voting in local elections in Caracas, Venezuela, Dec. 9, 2018. "All countries that defend democracy, all countries that share the value of democracy should unite to reject the Venezuelan dictatorship," Duque said. 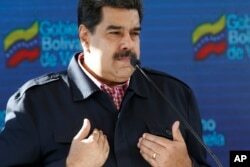 Maduro blames Venezuela's economic problems on U.S. sanctions and an "economic war" led by political adversaries.